To access our products and prices do not need to register, you only need to register to place an order. All prices shown in the store include VAT in force and for those which exceed the total amount of 150 € it will also include shipping to Spain - mainland. How soon serve the order? The period of preparation of the order and delivery is 2 to 5 working days, depending on volume. Usually they served within the following 48 hours after receipt of payment. If payment is made by Paypal or debit / credit card reception is immediate, by bank transfer between different banks is usually 24-48 hours delay. Can I pick up the order in physical store and save me the shipping? This option is only available for small orders. In any case, for orders over 150 € the shipping charges would be the same, 0 euros, and for smaller orders applies only € 5.90 + VAT for orders up to 1 kg and 0.5 € per additional Kg up € 39.90 plus VAT. In any case you consult your specific case can by contact or in info@tienda-solar.es. Through the store you can order the order to any postal location of mainland Spain. For other locations; Balearic Islands, Canary Islands, Ceuta and Melilla and other countries of the European Union, need shipping quote personalized. To do this, once you have decided the order, let us know through contact or email us to info@tienda-solar.es and we will provide the specific offer. What countries outside of Spain I can send my order? Perform sending orders to Germany, Austria, Belgium, Bulgaria, Croatia, Cyprus, Denmark, Estonia, Finland, France, Greece, Hungary, Ireland, Italy, Latvia, Lithuania, Luxembourg, Malta, Netherlands, Poland, Portugal, United Kingdom, Czech Republic, Romania and Sweden. What I have to pay VAT if the order is from outside of Spain? Tienda-solar is in the Register of Intra-Community Operators (ROI), therefore if you have a valid VAT number (companies only), the order will be without VAT, if you do not have it (private costumers) VAT will apply whit the destination country fee. How do I know what I'm buying is really what I need? Tienda-solar offers free advice to make your purchase with all the security to be buying what you really need. 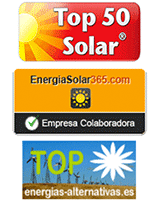 Contact us without obligation or in soporte@tienda-solar.es. Tienda-solar is installing the material? Tienda-solar only supplies the material, the installation is borne by the customer, whether a particular way or hiring an authorized installer. In either case, Tienda-solar can provide the advice necessary for proper installation of the equipment. If your purchased is not further needed or you simply had an error, do not worry, you have 15 days to make the return. Contact us as soon as possible to arrange it.